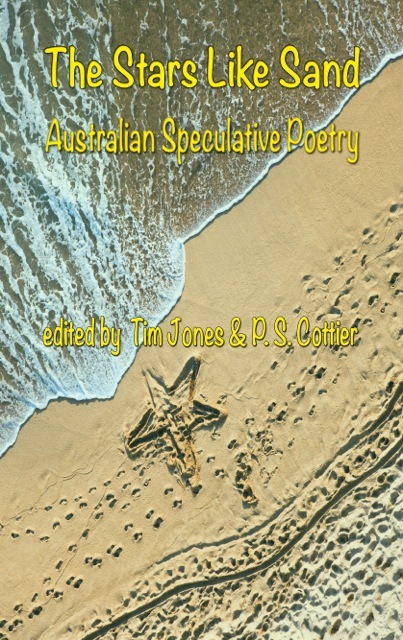 This is a small version of the cover for The Stars Like Sand: Australian Speculative Poetry (Interactive Publications), which should be out in late April. Click for a better look. Not a bad piece of flotsam. Or is that jetsam? No, they were the cartoon characters who lived in a perfect American future, weren’t they? With nifty jetpacks? When all this egregious specpo is over, I am going to read a novel of such staunch realism that you wouldn’t read about it. With a plot so heavy it would drown you, if you read it on a lilo floating on a pool. Unless, of course, it was a hover-lilo. Now there’s the ultimate personal transport device. I sneer at your pathetic jet-packs, American cartoon people. Stars like sand – sea like glass. Nice! I suppose the word LILO would be wrong if it hovered…Americans would sue when they fell off. And Hilo is taken. I love your humour, and look forward to the book. I’d love to read about the novel that you read; but please invent the hover lilo – why hasn’t it been done already!